The Gabbeh rug was introduced to the west in the early 1970’s when pieces were featured as part of an exhibition of lion rugs around the world. They drew much attention and became highly sought after and were prized by collectors. 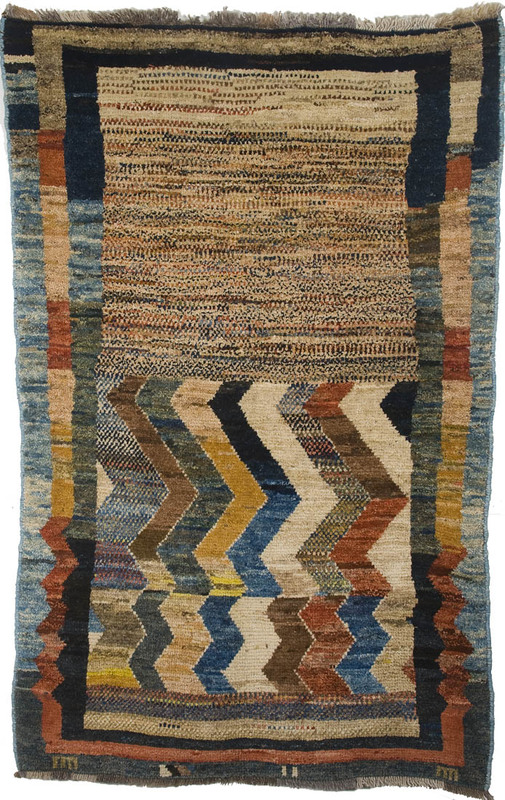 Woven by nomads in the Fars region of Southern Iran, these long-piled wool rugs were and still are used as floor coverings to smooth the rough ground of their tents in rocky, mountainous areas. These days Gabbehs are still praised and many consider them to be a free form of art. As there is little documentation regarding the history of the Gabbeh, there is much curiosity regarding the source of inspiration for these pieces. The motifs, the overall design, and different compositions used in Gabbehs appear to have a symbolic or mysterious significance. This has led to much investigation into Iranian folklore, including fairytales, magical practices and fortune telling. The appealing innocence of the abstract design and vivid colour palette gives each piece a sense of originality and uniqueness.